Here at Home Health Living, we’ve been writing about water filters for a few years. We have experience with different types of water filters: countertop water filters, under sink water filters and water filter pitchers, just to name a few. Here’s our review of the best reverse osmosis system. While there are many water filters on the market that remove fluoride, not all do. The most effective way to remove fluoride from your drinking water is to use a reverse osmosis water filter system. Reverse osmosis is a process that pushes water through a semi-permeable membrane filter. This removes all impurities from water, including fluoride. It leaves you with water that is the closest to pure water. Reverse osmosis is only one stage in the water filtration process. 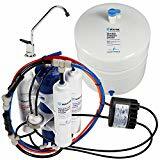 The best reverse osmosis filter systems we’ve reviewed in this post contain the membrane filter but also various other filters. Reverse osmosis filtration systems can be expensive and complicated. We’ve reviewed the best reverse osmosis filter systems to help you decide which one to buy. Keep reading after the reviews for detailed information about the reverse osmosis process. 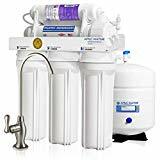 We’ve decided the best reverse osmosis water filter system is the Home Master TMACFC-ERP Artesian reverse osmosis system. We’ve chosen it because of its performance as well as being relatively well-priced. You’ll find that most reverse osmosis systems are very expensive, so we’ve chosen a system that won’t hurt your budget (much). The TMACFC-ERP is an under sink system that you can install yourself. It can produce up to 75 gallons per day of filtered water. It’s tank can hold up to 3.2 gallons of water- water is held in the tank until you need to access it. It has 7 stages of filtration like most other systems. However, what we like about the TMACFC-ERP is that it has a remineralization filter. During the filtration stages, all minerals are removed and you’re left with bland-tasting water. The remineralization filter adds healthy minerals into the water that raises its pH level so that it’s more alkaline. It gives the water a better taste that’s healthy for you. We also like this system because it comes with a permeate pump. The pump increases water pressure which helps push the water through the filters at a higher pressure. When you’re filtering water, the “unhealthy” water is drained. With lower water pressure, you could be wasting up to 3 gallons of water flushing away impurities. Using a permeate pump to increase water pressure means you’re only wasting 1 gallon of water instead. This will save you money on your water bills! The only thing this system doesn’t have is a UV light, however this is what makes the system slightly cheaper than other brands that do have the UV light. Finally, we love the TMACFC-ERP system because it comes with a 5-year warranty which is better than warranties offered by other reverse osmosis manufacturers. Much like it’s cousin, the HydroPerfection reverse osmosis systems offers you excellent performance with every filtration stage including remineralization. In total, there are 9 stages of filtration! It has a UV light which kills 99.8% of microorganisms found in water. Most water sources have very low levels of microorganisms except for well water and other natural sources. If you use well water and need a reverse osmosis water filter system for well water, then the HydroPerfection is the best system for you. It will treat your well water so that it’s safer to drink. The UV light needs a power outlet to work. The Home Master TMHP also has a permeate pump to increase water pressure so that you’re not wasting as much water as you would without the pump. A common complaint about reverse osmosis systems is that the water pressure drops due to the water passing through many filtration stages. The pump helps combat this problem. The only downside to the HydroPerfection is the price- it ranks among the most expensive of all reverse osmosis filters. You would have seen that the Home Master TMAFC-ERP Artesian is our top pick for the best reverse osmosis water filter system. The Home Master TMAFC Artesian is similar to the ERP Artesian however the biggest difference is the TMAFC DOES NOT include a permeate pump. A permeate pump helps if your existing water pressure is low. The reverse osmosis process reduces your water pressure and this is the biggest complaint consumers have about reverse osmosis. To help combat this problem, a permeate pump helps to increase water pressure. Increased water pressure means you will waste less water- unfortunately the TMAFC Artesian wastes up to 4 gallons of water. The ERP Artesian only wastes 1 gallon. If your existing water pressure is strong, then you won’t need a permeate pump. And if you aren’t concerned about water wastage, then the Artesian is a good choice. If water wastage and water pressure are important to you, then choose the ERP Artesian. The other difference between the Artesian and the ERP Artesian is that the Artesian doesn’t include a UV light. UV lights help kill bacteria found in water. Whether this is important to you depends on your source water. It’s a good idea to check your local water quality before deciding if it’s important to have a filter system with a UV light. We also like that Home Master offers a 5-year warranty which is more than any other manufacturer in our list. 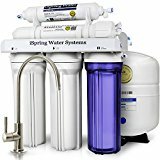 While the iSpring RCC7 is not Home Health Living’s number 1 choice for best under sink reverse osmosis water filter for 2017, we still rate it highly. 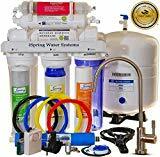 Manufactured in the U.S.A., the iSpring RCC7 is a reliable and popular under sink reverse osmosis water filter sytem that has been gold seal certified by the WQA. It rejects up to 99% of contaminants including chlorine, lead, arsenic, pesticides, fertilizers and fluoride. Its 5 system filter cartridges are cheaper to replace than other system cartridges, however this could be due to a granulated activated carbon filter being used. This makes the iSpring more cost effective. The 1st stage filter is housed in transparent casing so that you can see how dirty the filter is and have a better idea of when to change it. Other systems such as the APEC use a more superior carbon filter. Nonetheless, the iSpring RCC7 has received many positive reviews from consumers. All components of the iSpring system are food grade certified and independently tested for quality. Tubing is color-coded for ease of installation. The automatic shut-off valve has undergone improvements since the last iSpring model was on the market. The feed water adapter was also upgraded to solid metal to prevent leakage and connection issues. There is also a water detector included which works as an alarm in case of water leakage. The faucet included with the iSpring water filter system is a high quality, lead-free European designed faucet. It comes in a number of different finishes, including brushed nickel and chrome. 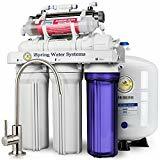 iSpring is a well-known brand, and we’ve chosen the RCC7AK as one of the best reverse osmosis water filter systems because it has 6 stages of filtration. The unit produces 75 gallons of output per day with 3 gallons of waste water. You might be wondering, what’s the difference between the iSpring RCC7 and the iSpring RCC7AK? The main difference between the two is that the RCC7AK has a remineralization filter that adds the minerals back into the water. The RCC7AK is easy to install yourself- if you have good DIY skills, it should take you about an hour. We’ve chosen the APEC as the best reverse osmosis water filter because of a number of reasons, but mainly because of the quality of the system. It is U.S. manufactured to high standards by a WQA-certified manufacturer, and features leading technology that removes up to 99% of contaminants. The APEC can remove arsenic, lead, bacteria, viruses, heavy metals and of course fluoride. The water filters are premium and long-lasting while the fittings are quick and easy to connect with no extra steps required to seal or prevent leakage. All tubing is certified food grade standard, and the chrome faucet included with the system is 100% lead-free. The feed water adapter is versatile, and has been made to suit most under counter water feed lines, with either a 3/8” or ½” connection. There is a 1-year warranty and lifetime technical support available. 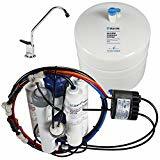 Another popular Apec water filter system that gets many positive customer reviews is the Apec Top Tier Supreme High Flow RO-90. This is a slightly different model to the ROES-75 because it produces 90 gallons of output per day. This is more than any other reverse osmosis system on the market. 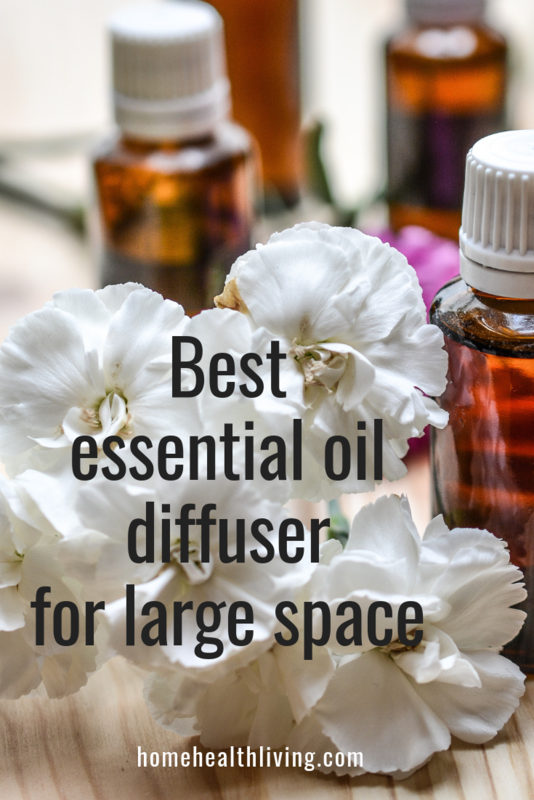 This is great if you use a lot of water- if you have an aquarium or if you use a lot of water in the kitchen for cooking or coffee making. There are 5 filtration stages and the unit wastes 3 gallons of water every time it produces 1 gallon of pure drinking water. Included with the unit is everything you need to set up the system quickly and easily and also comes with a faucet and pressurized storage tank. We’ve already reviewed the iSpring RCC7 and the RCC7AK. This model is the RCC7AK-UV which is similar to the RCC7AK except that it also has a UV light filter. A UV light can kill any bacteria and other microorganisms still left in the water even after passing through the reverse osmosis filter. The chance of bacteria being found is small, since most municipalities already treat their water for bacteria, however some people like the extra filtration that a UV light provides. There are 7 filtration stages and the unit produces 75 gallons of output per day and wastes 3 gallons of water. As with other systems, the iSpring comes with everything you need to install the system yourself. Best reverse osmosis water filter U.K.
APEC’s countertop reverse osmosis water filter system is made in the U.S.A. and is a high performance reverse osmosis system. It features a 4-stage filtration process that removes contaminants such as chlorine, VOCs, arsenic, lead, bacteria, viruses and fluoride. The 3rd stage features a membrane made by world-leading Dow “Filmtec” high rejection reverse osmosis membrane. The APEC is a very easy to use system- it is lightweight, and requires no installation. All you need to do is hook it up to your faucet and it is ready in minutes. The system is portable, so it is perfect for those who are travelers, renters or students living on campus. 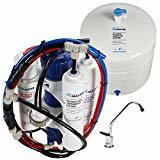 The Reverse Osmosis Revolution portable universal reverse osmosis water system is a U.S.A. made, 5-stage water filtration system. It is ideal for people who move a lot, such as travelers, students and those living in rental accommodation. The system delivers around 3 gallons of filtered water per hour. The system easily attaches to most kitchen faucets without the need for a plumber for installation. The filtration process involves a 5-stage system that removes most contaminants in your drinking water. The U.S.A.-made reverse osmosis membrane removes contaminants including arsenic, aluminium, cyanide, chloride, calcium, mercury, lead, fluoride, herbicides and insecticides. The unit comes with a chrome metal diverter for kitchen faucets, and fits most kitchen faucets. Reverse osmosis water purification features a high pressure pump that pushes water through a semi-permeable membrane which can remove the finest of contaminants in water, including fluoride. Reverse osmosis means that for every part of filtered water, there are between 1 to 3 parts of water that is flushed away along with all the contaminants. Many people view this as being wasteful, and of course it does mean that you are using more water (and paying for it). Some suggest using the “wasted water” on your garden. People often complain about their reverse osmosis system, saying that the water pressure reduces after installation of the filter system. Yes, reverse osmosis removes fluoride. It is the most effective way to remove fluoride from drinking water. Yes, reverse osmosis removes chlorine. Yes, reverse osmosis removes lead from drinking water. Yes, reverse osmosis removes bacteria from your drinking water. Does reverse osmosis remove minerals? Yes, reverse osmosis removes minerals from drinking water. 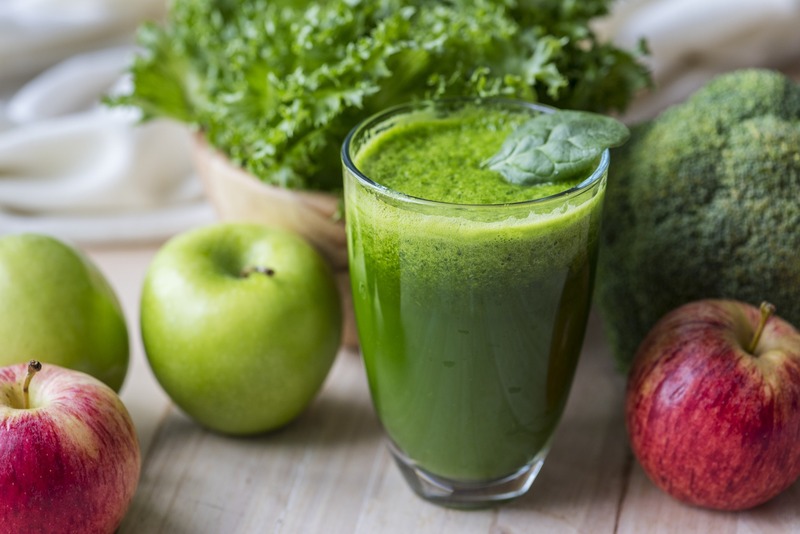 To add back healthy minerals, look for a reverse osmosis water filter system that includes a remineralization filter. Does reverse osmosis remove salt? Yes, reverse osmosis water filters remove sodium/salt. Does reverse osmosis remove nitrates? Reverse osmosis water filter systems remove nitrates. Does reverse osmosis remove e coli? Yes, reverse osmosis does remove most bacteria such as e coli. Does reverse osmosis remove arsenic? Reverse osmosis can remove arsenic. Yes, reverse osmosis removes calcium and magnesium from your water. To add these back into your water, you will need a remineralization filter. Does reverse osmosis remove hardness? Yes, reverse osmosis systems remove the minerals that cause water hardness. Does reverse osmosis remove chloramine? An extensive carbon filter and reverse osmosis filters are both needed to remove chloramine. Does reverse osmosis remove iron? Yes reverse osmosis removes iron from your drinking water. Does reverse osmosis remove calcium? Yes, calcium is removed from water by using a reverse osmosis filter. Yes, reverse osmosis systems waste water. Up to 3 gallons of water is wasted for every 1 gallon of filtered water. Does reverse osmosis remove lead from water? Yes reverse osmosis removes lead from water. Does reverse osmosis remove radon? No, reverse osmosis does not remove radon or other gaseous contaminants such as carbon dioxide. Does reverse osmosis remove pesticides? Reverse osmosis removes most but not all pesticides. Does reverse osmosis remove aluminium? Reverse osmosis typically removes 98% of aluminium. Does reverse osmosis remove copper? Reverse osmosis removes up to 98% of copper. 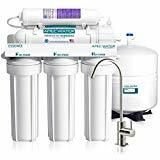 Is it true that reverse osmosis does not remove chlorine? A reverse osmosis membrane cannot filter chlorine, BUT this is a non-issue, because in a reverse osmosis system there are carbon filters in earlier stages that remove the chlorine. By the time the water reaches the membrane, the chlorine has already been filtered out. A reverse osmosis membrane would be ruined if chlorine was still present in the water. Does reverse osmosis remove essential minerals and nutrients in our water? Yes, reverse osmosis filtration removes minerals found in water. But according to this article about reverse osmosis, our nutrient and mineral intake from food is more important than our mineral intake from water. What is more important is removing the chemicals found in water. What’s better- a reverse osmosis under sink or countertop water filter system? It’s really a matter of personal preference. Some people prefer the system to be hidden away under the sink, especially if they have space under their sink. Other people move around a lot and cannot attach something permanently to their kitchen faucet, so a portable countertop system is much better. Our reverse osmosis water filter reviews cover both under sink and countertop systems. 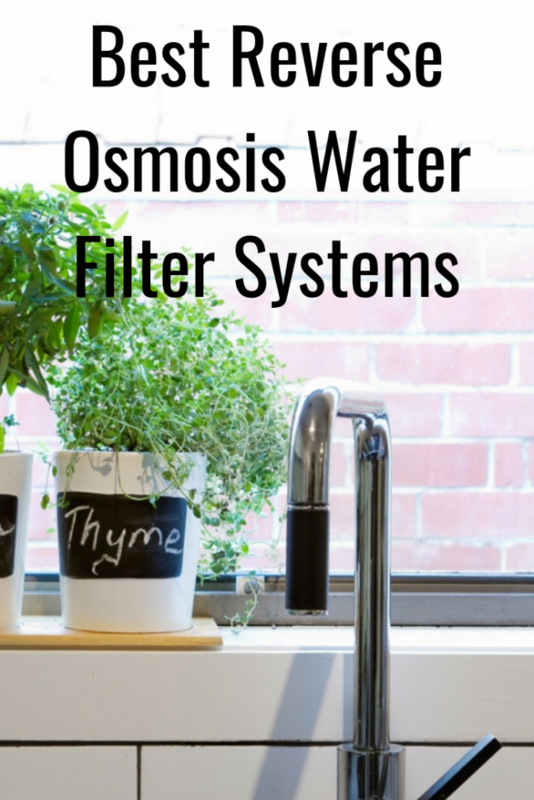 A reverse osmosis water filter system gives you extra filtration that is not found with other filters found in water filter pitchers and other countertop systems. The extra filtration provided by the reverse osmosis membrane is important to many people, especially those who believe that fluoride contributes to health issues. A reverse osmosis water filter removes most fluoride. If you think a reverse osmosis water filter is out of your budget range, then there are cheaper water filter options available for you, such as a water filter pitcher. We have detailed reviews of the best water filter pitchers on the market in 2018.